Capitalists@Work: What's This - Some Tory Energy Policy ? What's This - Some Tory Energy Policy ? Wow. Where do we start ? Firstly, Clark had better decide whether he intends to follow anything approaching NuLab’s fantasy-plan for renewables – because if so, he’ll need the Big 6 to make it happen. Hopefully, though, someone will tell him what everyone in the industry knows, viz that 30% renewables by 2020 is utterly, utterly infeasible, in which case let’s move on. Remember this ? 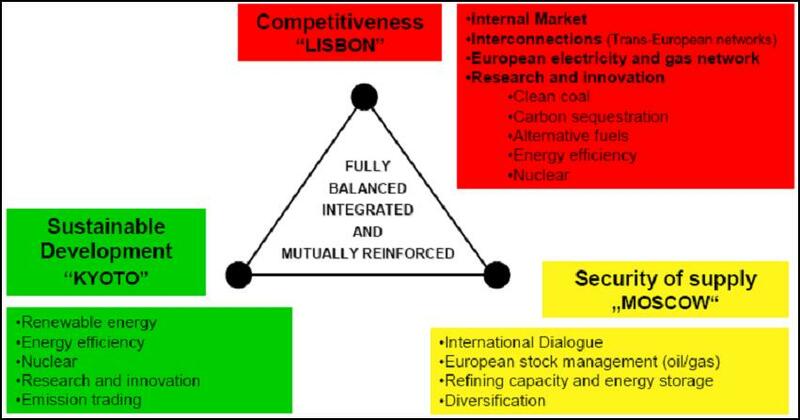 However much the EC likes to think they are all mutually reinforcing, the drivers of the ‘policy triad’ are inherently in tension. Improving competition trumps renewables so far as I am concerned, and vertical integration is anathema. But before we break up our vertically-integrated Big 6 – shades of breaking up the ‘Big 3’ ten years ago – let’s please remember the major setbacks that have been suffered since 2001, when the UK looked to be set fair for a highly competitive energy future. Firstly, the collapse of Enron and the ‘merchant energy’ business model in 2002, and with it liquidity in the forward markets. Then, the complete failure to enforce the EC directives on EU gas-market opening in time for when the UK became a net importer of gas in 2004. Next, the banking crisis which snuffed out much of the intelligent new sources of liquidity that had almost replaced Enron & Co: and finally the cementing of the vertical integration model when EDF was allowed to buy BE (the last big structural long) and sold on a large slice to Centrica (the last big structural short). And Brown sold Westinghouse just when we need nuclear power stations. Is there anything that man does right? You're the expert, I thought that you said collusion/cartel behaviour between Big 6 wasn't such a big problem. What is a problem IMHO is that the EU wants us to shut down the coal fired power stations plus engage in all sorts of other highly expensive tomfoolery. Plus all the Greenies and NIMBYs who don't want any more power stations built. The latter group are even against windmills. Have added your energy policy to my words of wisdom. Nick: now, write that book, and back it up with a couple of YouTube tasters. You know there's more to being a commissioning editor than telling people to write that book, S. You'll have to get him to hand over what's ready, discuss what needs to be covered, minimum, get him to rewrite the whole thing when the gaps are filled - holding his hand, so to speak, the while. And you do have to have a publishing house he respects behind you; no-one writes books on spec. Energy in the Modern World: Lifestyle preservation and geopolitics. would catch the eye in a bookshop. 60,000 words with data and graphs to bump the pp up a bit, references and bibliography, £19.95. Mark - yes, I reckon 6 (properly regulated) can be an OK level of competition. but they can yet be scared off if govt (NuLab or Cons) screws up ! Sackers, HG, what can I say ? The lights are still on here, but it's freezing! The landlady hates bills and since she's nice and always invites me over for drinks, Sunday lunch etc I'm braving it with the tealights. CEGB Not found, see strike, Winter-of-Discontent. It's a bold move by Clark and I think he underestimates the contradiction between expecting big investment in renewables while simultaneously hacking away at the only people with enough capital to invest in renewables.